Child-friendly? If a film starring an animated zebra, giraffe, lion and hippopotamus wasn't child-friendly, you can bet the executive producer would be out of a job. Kids of all ages will be thrilled to see Marty, Melman, Alex and Gloria up to their usual antics as part of the circus in Madagascar 3: Europe's Most Wanted. When I first saw the trailer months ago, the row of children behind me exploded into giddy shrieks of excitement and laughter, so I knew that I'd be taking my own kids to see this much-awaited three-quel from that very moment. While I'm tempted to slam this movie, there are a few aspects that actually saved it, and I'm not just talking about those diabolical penguins who function as the de facto special ops team for the critters from Madagascar. 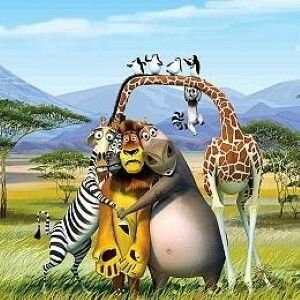 After successfully finding their way out of Africa in the second movie, Marty the Zebra (Rock), Alex the Lion (Stiller), Melman the Giraffe (Schwimmer) and Gloria the Hippopotamus (Pinkett Smith) make an unexpected pit stop in Monte Carlo on their way home to New York City's Central Park zoo. Of course, you can expect a foursome of wild beasts to attract some attention in one the poshest cities in Europe, and they find themselves promptly on the run from the local animal control – led by Captain Chantel DuBois (Frances McDormand). On the lam, the crew stumbles into a traveling circus making its way across Europe toward London. While it seems like the perfect cover for Marty, Alex, Melman and Gloria, the circus' leader, a Siberian tiger named Vitaly (Bryan Cranston, who perfectly segues from a meth dealer on Breaking Bad to this lovable cartoon character) treats them with distrust – as talking tigers are wont to do. In order to stay and prove their value to the diminished circus act, the group must put on the spectacle of the year and revitalize the traveling band of entertainers. The overall story is pretty standard kiddie-movie fare, but it's the little moments of slapstick hilarity that occur between the characters that actually make this one watchable. If all else fails, at least your kids didn't drag you to Battleship – yikes. Child-friendly? You can bet your kids will get the most out of Madagascar 3, but I couldn't help but chuckle at Sacha Baron Cohen as King Julien XIII and his meddlesome penguins or the always hilarious Martin Short as the sea lion Stefano. Recommended for children of all ages.